If you’d like to take full advantage of your home’s outdoor living area, one of the sunrooms installed by Allmaster Home Services will allow you to do just that. Since 1987, we have helped residents throughout the Annapolis, Maryland, area maximize their outdoor living spaces with our top-of-the-line products and expert installations. Manufactured by Betterliving Sunrooms, a leading name in the industry, our structures are ideal for enjoying the beautiful weather that Maryland has to offer all year long. Studio roof – These structures boast a sloped roof that will seamlessly blend in with your single-story home or raised deck. Gable roof – This option is ideal for two-story or split-level homes and will instantly add extra light and height to your residence. Enclosed porch – If you want to make the most of an already existing porch, we can turn your open porch area into a cozy enclosed space you can enjoy year-round. All of our structures are manufactured with sturdy, state-of-the-art vinyl with no visible fasteners for a seamless appearance. 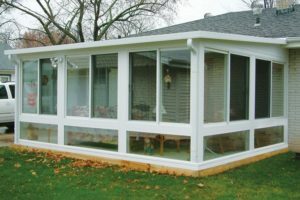 Plus, our sunrooms are fully insulated and can be heated or cooled, and even boast built-in, color-matched gutters for superior water protection and a sleek aesthetic appeal. To learn more about the many benefits that come with the installation of one of our sunrooms on your home in Annapolis, MD, contact Allmaster Home Services today.